For those new to solar see our how solar works article here. Why store solar energy in a battery? Many governments and network operators have reduced the solar feed-in tariff or FiT (money or credit received for feeding solar energy to the grid). This means traditional grid-feed solar systems have become less attractive as most people are working during the day and not home to use the solar energy as it is generated, thus the energy is fed into the grid for very little return. A solar hybrid system stores your excess solar energy and can also provide back-up power during a blackout. This is perfect for home owners although for the majority of businesses which operate during the daylight hours, a common grid-feed solar system is still the most economical choice. Hybrid solar systems enable you to store solar energy and use it when you're home during the evening when the cost of electricity is typically at the peak rate. The ability to store and use your solar energy when desired is referred to as self-use or self-consumption. It works in the same way as an off-grid power system but the battery capacity required is far less, usually just enough to cover peak consumption (8 hours or less) as opposed to 3-5 days with a typical off-grid system. Higher cost than grid-tie solar. Mainly due to the high cost of batteries. More complex installation requires more room and higher install cost. Battery life of 7-15 years. 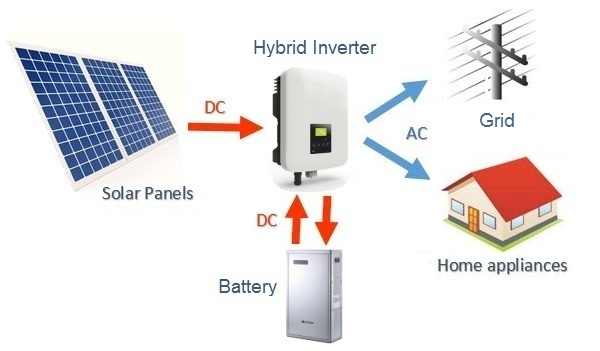 Until recently (before cheaper all-in-one hybrid inverters) most hybrid systems consisted of two different inverters which worked together to form what is known as an AC coupled system; a standard solar inverter and a sophisticated interactive or multi-mode battery inverter. The Solar inverter can be any standard unit but it is usually either the same brand or is compatible with the interactive inverter to optimise battery charging. The interactive or multi-mode inverter acts as a battery inverter/charger and complete energy management system, using clever programmable software to optimise energy usage. Interactive inverters supply power in the same way as an off-grid inverter but also control grid connection (import and export power) and can be setup to automatically start and run a back-up gen-set (generator). Advanced AC coupled systems are used for off-grid and hybrid installations which require a high level of power management. The powerful software used to run multi-mode inverters enable energy controls such as peak shaving, plus data logging and PLC capabilities through digital input/outputs and relay controls. These systems can also work with very large battery banks and incorporate specialised battery monitoring and temperature sensors to prolong battery life. Due to the many features and advanced software the cost of interactive inverters is typically higher than all-in-one inverters but in many applications the extra cost is worth the additional investment as they are generally more reliable, more efficient and enable future expansion. Refer to our hybrid inverter and system review for the full list of hybrid systems and inverters available.